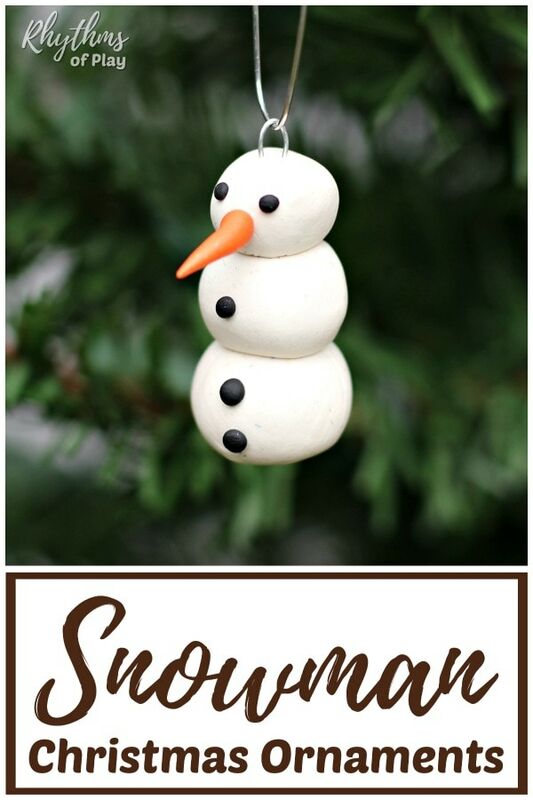 Make some homemade snowman ornaments to decorate your Christmas tree. 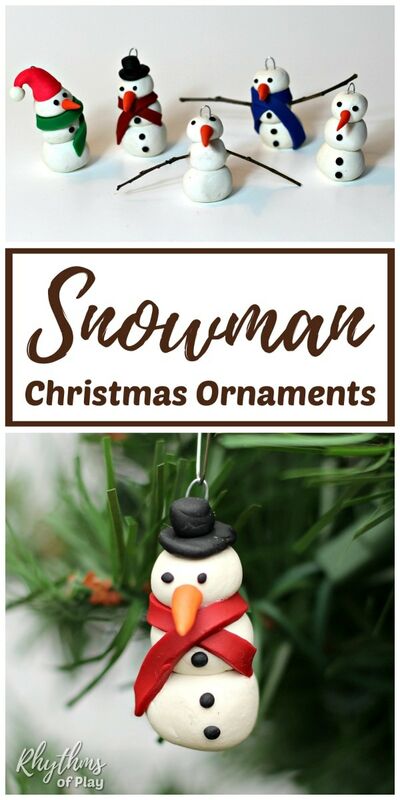 Try any of these clay snowman crafts with your kids to make DIY snowman Christmas ornaments your family will treasure for years to come! My daughter squealed with excitement, and I’ll bet your kids will too! Of course, this meant that we also made a handful of Frozen Inspired Olaf ornaments, and snowman head ornaments as well. How could we build a snowman and not build Olaf?! Have you ever built a snowman and discovered the next day that his grin has gotten a little crooked, or his tree-branch arms have moved? And you’ve wondered . . . what do snowmen do at night? This delightful wintertime tale reveals all! Caralyn Buehner’s witty, imaginative verse offers many amusing details about the secret life of snowmen and where they go at night, while Mark Buehner’s roly-poly snowmen are bursting with personality and charm. From the highly successful team that created such winning titles as Fanny’s Dream, Snowmen at Night is fabulous, frosty, and fun! Look at how well our homemade snowman ornaments turned out. Each clay snowman craft melted and leaned perfectly here and there so that they really do look like snowmen at night! 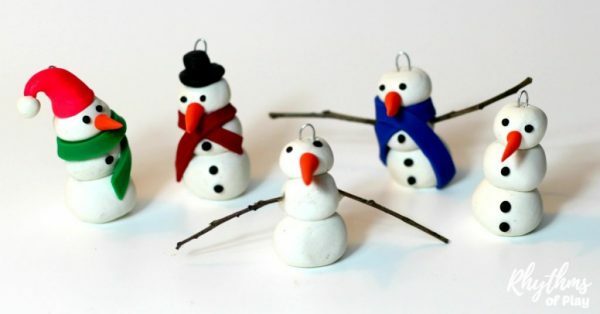 There are lots of ways to put these cute little clay snow people ornament crafts together. We made them five different ways and I’m sure you could come up with a lot more! Basic assembly directions for polymer clay DIY snowman ornaments are written below followed by complete step by step directions and photo tutorials for each of the different types of snowmen and women ornament crafts we made. Wash your hands and clean the surface you will be working on. Polymer clay picks up every speck of dirt it can find. This is especially important for white polymer clay! You will even need to wash your hands after working with a color if you will be working with white again. Yes, really. I kept a wet washcloth nearby to keep our hands clean as my daughter and I worked. Make and collect pieces for polyform clay snowman ornaments; body, nose, eyes, buttons, arms, scarf, top hat or cap, twig arms, snowball legs, etc. Assemble homemade snowman ornaments by sticking the pieces together. Start with the body. Next, add a scarf if using one, then the nose and eyes, buttons and/or any other hats and accessories you’d like to use to make your snowman crafts. Last add twig arms and/or snowball legs if desired. Cut 2-1/1/2 inch section of galvanized wire and bend it in half. Place this homemade ornament hook prongs down into the top of your ornament. It will bake into the polymer clay to produce a strong ornament hanger to use to hang your snowman ornaments on your Christmas tree. Place clay snowman crafts on a baking sheet lined with parchment paper standing upright so they can gently lean and melt like snowmen at night. Bake according to polymer clay manufacturers directions. We baked our polymer clay snowman ornaments in a 275 F oven for 25 mins. 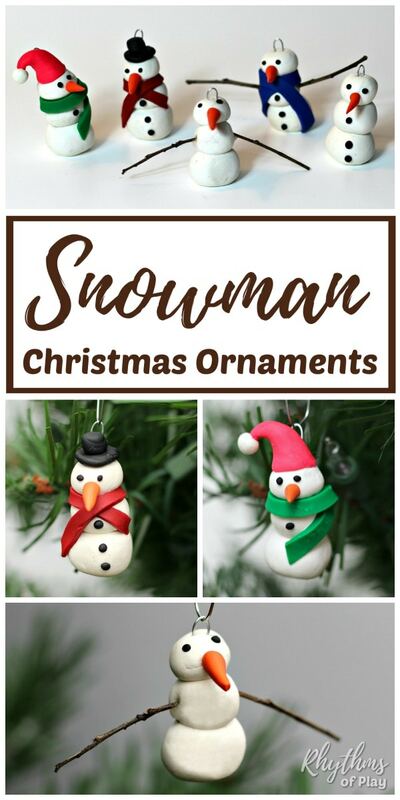 Tie ribbon, bakers twine or place an ornament hook on each clay snowman ornament to hang it on your Christmas tree or place on mantles or windowsills for the coolest snowman Christmas decorations around! Don’t forget to wash your hands before you start… white polymer clay will not forgive you if you don’t! Build a polymer clay snowman by rolling two or three sections of white polymer clay into balls. Stack them one on top of the other with the largest clay snowball on the bottom. Add a clay carrot nose to your snowman ornaments. The easiest way to make a carrot nose is to roll a little bit of orange polymer clay into a small ball. Next, roll one side of it like a snake until you have a small carrot. Putting the nose on your snowman crafts first makes it easier to know where the eyes go. Roll tiny sections of black clay into small balls to make coal eyes and buttons and place them onto the face and body of the snowman ornaments if desired. Tie ribbon, bakers twine or place an ornament hook on each clay snowman ornament to hang it on your Christmas tree or place on mantles or windowsills. Add a clay carrot nose to your snowman ornaments. The easiest way to make a carrot nose is to roll a little bit of orange polymer clay into a small ball. Next, roll one side of it like a snake until you have a small carrot. Putting the nose on your snowman ornaments first makes it easier to know where the eyes go. Roll tiny sections of black clay into small balls to make coal eyes and place them onto the face and body of the snowman ornaments. 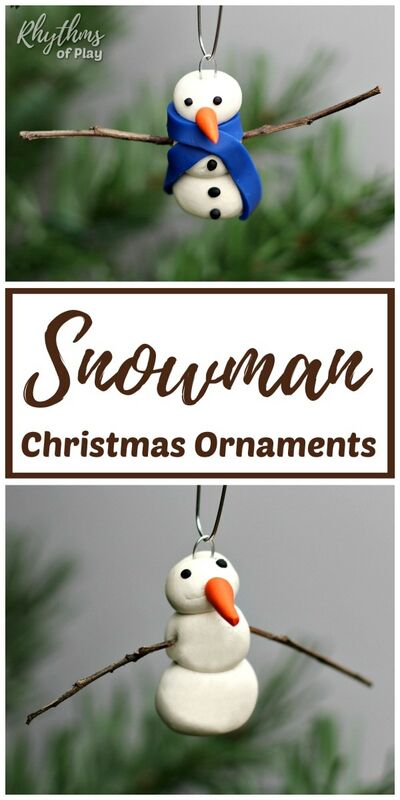 Choose the twigs that you would like to use and insert them into the left and right side body of each snowman ornament craft. Cut 2-1/1/2 inch section of galvanized wire and bend it in half. 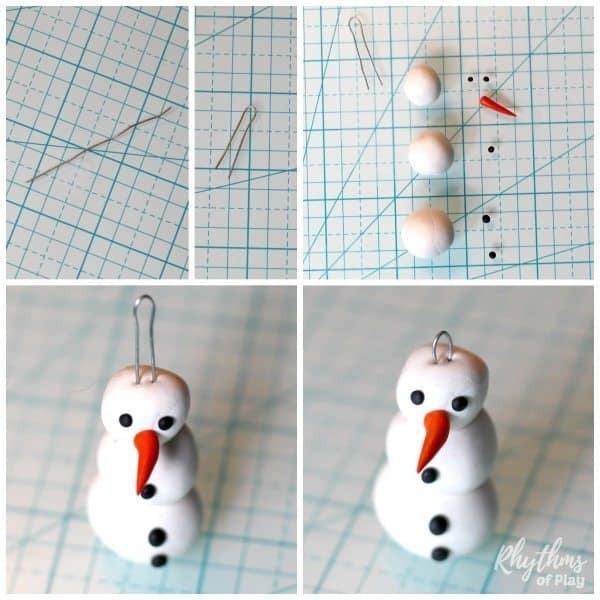 Place this homemade ornament hook prongs down into the top of your snowman ornaments. It will bake into the polymer clay to produce a strong ornament hanger to use to hang your clay snowman ornaments on your Christmas tree. Place homemade snowman ornaments on a baking sheet lined with parchment paper standing upright so they can gently lean and melt like snowmen at night. Before baking, gently pull out the twigs and dot polyform bake and bond (included in set glaze listed above) into the holes before putting the twigs back in so that they will be permanently baked into the body of the snowman ornaments. Tie ribbon, bakers twine or place an ornament hook on each snowman ornament to hang it on your Christmas tree or place on mantles or windowsills. My daughter made this one… Isn’t it’s expression lovely! We recommend that you use a glass cutting mat to make polyform clay snowman scarves. Most colors of polymer clay can stain. You can see the red coming off slightly in the photos below. A glass cutting mat can protect your table from stains and cuts, and make it possible to pick up a small snowman scarf up without it tearing. 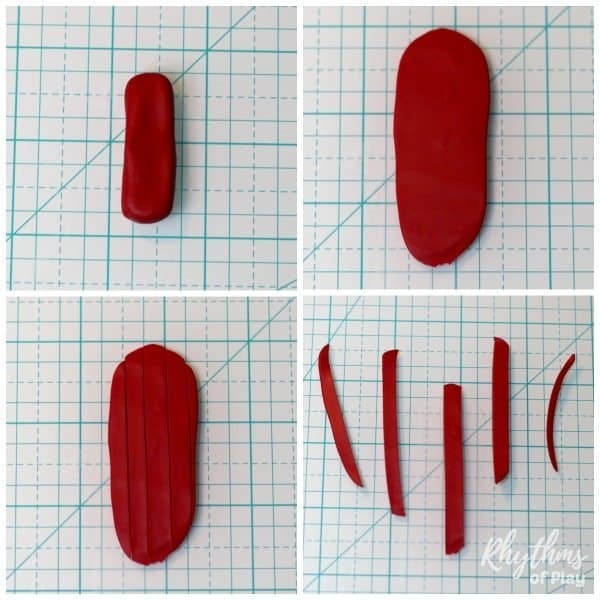 Use your fingers to form a small rectangle of polyform clay. Flatten polyform clay rectangle with a rolling pin or a jar on a glass cutting mat to protect your table. Use an Exacto knife or clay tools to cut strips. Gently pick each strip up and wrap it around your snowman crafts. 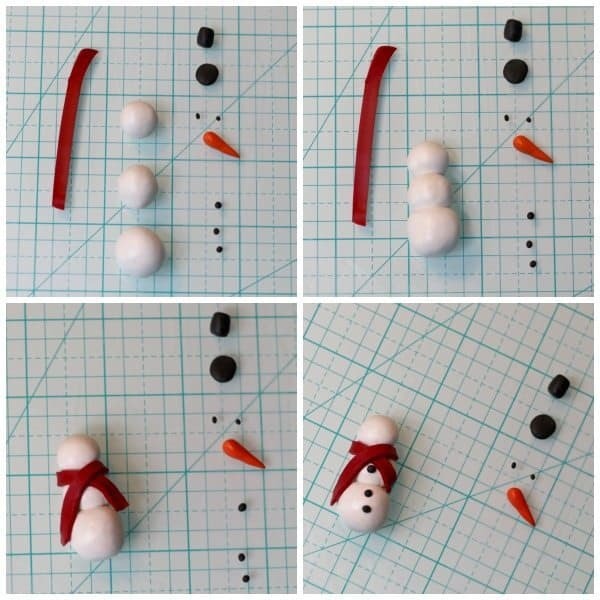 Build a snowman by rolling two or three sections of white polymer clay into balls. Stack the polymer clay snowballs one on top of the other with the largest clay snowball on the bottom. Wrap a polyform clay scarf around the body of snowman crafts. Pull gently on each side to make it longer if needed. Roll tiny sections of black clay into small balls to make coal buttons and place them onto the body of the clay snowman ornaments. Place top hat on snowman ornament. To make the top hat roll two balls of black polyform clay. Flatten one of the balls of black clay to be the bottom of the top hat and form the other into a cylinder shape and attach it to the top of the flat circle. Add a carrot nose to your snowman ornament craft. The easiest way to make a carrot nose is to roll a little bit of orange polymer clay into a small ball. Next, roll one side of it like a snake until you have a small carrot. Putting the nose on your snowman first makes it easier to know where the eyes go. Roll tiny sections of black clay into small balls to make coal eyes and place them onto the face of the snowman ornaments between the hat and the carrot nose. Cut 2-1/1/2 inch section of galvanized wire and bend it in half. Place this homemade ornament hook prongs down into the top of your ornament with a slight inward angle from the back of the hat. 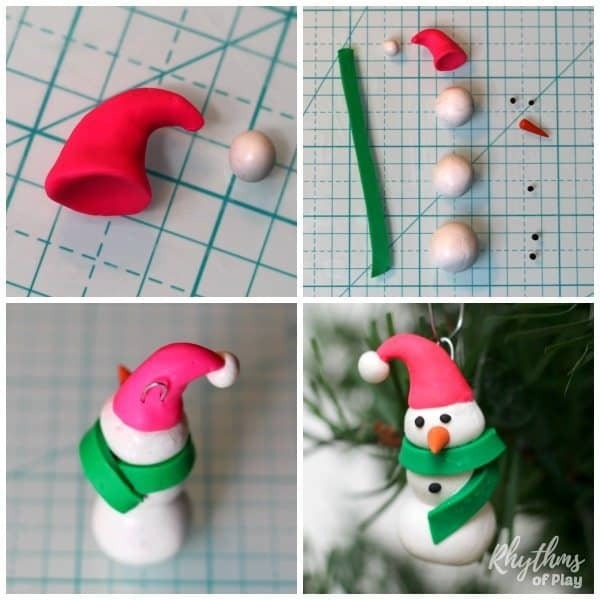 It will bake into the polymer clay to produce a strong ornament hanger to use to hang your snowman ornaments on your Christmas tree. 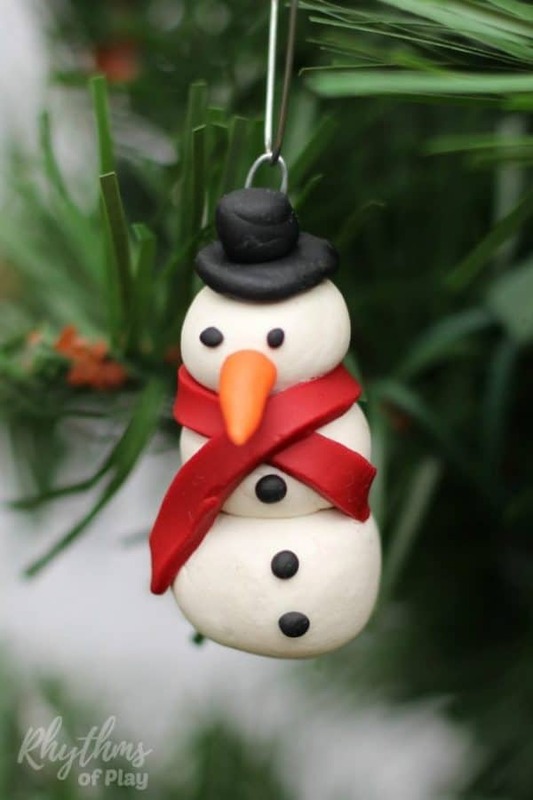 Build a snowman by rolling two or three sections of white polymer clay into balls. Stack the clay snowballs one on top of the other with the largest clay snowball on the bottom. Form a cap from a ball of clay by placing your thumb on one side to create the inner edge, then gently pull and form the rest of the clay into a cap shape with your thumb and forefinger of the other hand. We found spinning it around while we worked to be effective. When finished attach a small white ball of clay to the tip of the cap. Wrap a polyform clay scarf around the body of the snowman ornament. We wrapped the clay snowman scarf pictured below a little differently than the one pictured above. Again, you can pull the clay scarf gently to make it longer if needed. Roll tiny sections of black clay into small balls to make 1 to 5 coal buttons and place them onto the body of the clay snowman ornaments if desired. You may find that you don’t have room for all the buttons depending on how you wrap the scarf. We only ended up using one button of the three I made for the snowman craft pictured below. Roll tiny sections of black clay into small balls to make coal eyes and place them onto the face of the snowman ornaments between the cap and the carrot nose. Cut 2-1/1/2 inch section of galvanized wire and bend it in half. Place this homemade ornament hook prongs down into the top of your ornament with a slight inward angle from the back of the snowman cap. It will bake into the polymer clay to produce a strong ornament hanger to use to hang your snowman ornaments on your Christmas tree. 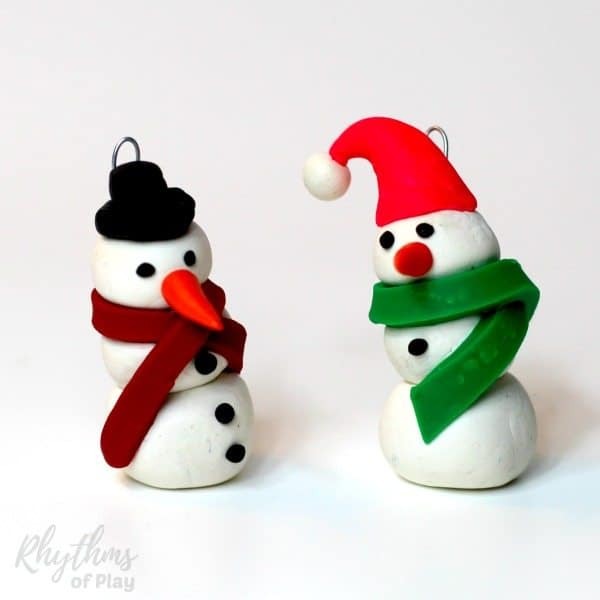 Build a polymer clay snowman by rolling two or three sections of white clay into balls. Stack them one on top of the other with the largest clay snowball on the bottom. Roll tiny sections of black clay into small balls to make coal eyes and buttons and place them onto the face and body of the snowman ornaments. Choose the twigs that you would like to use and insert them into the left and right side body of the snowman ornaments. This is the second snowman ornament craft my daughter made before she made Olaf over and over, and over again. I cut the scarf for her but she did everything else on her own–isn’t it cute!? I’m sure you see where this is going… You can make handmade snowman ornaments with a scarf, top hat or cap and twig arms with or without buttons. You can design a different type of cap, or, you could have one holding a flower, snowflake, or gift… Or you can build Olaf, etc., etc. The possibilities are endless! 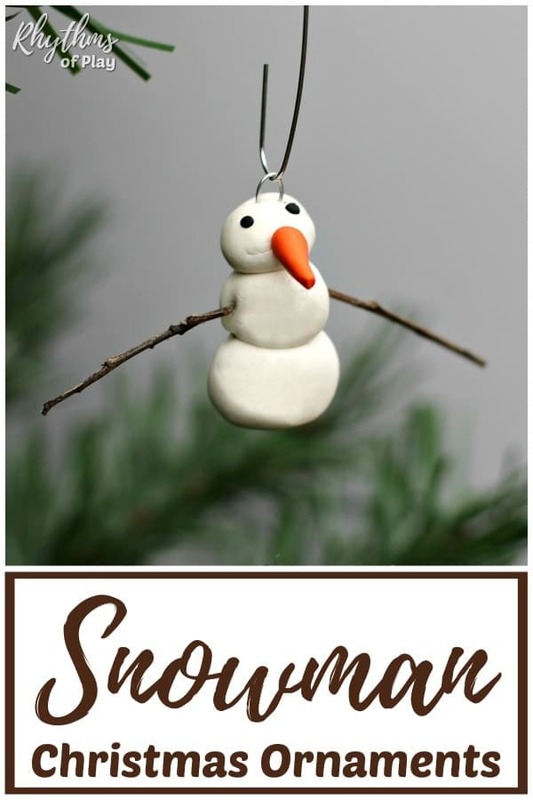 Making snowman ornaments with polymer clay is a simple craft that both kids and adults can make. 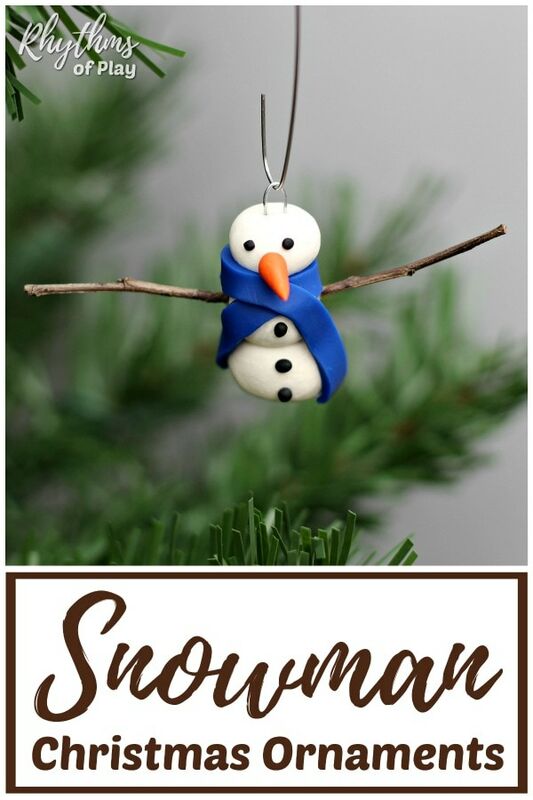 Handmade ornaments like these cool snowmen ornaments are perfect for the Christmas tree. Or, try these homemade snowman head ornaments… They all make beautiful handmade decorations and great kid-made gift ideas! Be sure to check out Christmas ornaments kids can make, 30 fun family Christmas traditions, and Christmas art projects for kids for more fun ideas!